One thing about baking in India is that you don't get a lot of base ingredients for most of the recipes. This leaves you with no option but to make the base ingredient all by yourself. However, once you make the base ingredient, you realise how easy it is to Do It Yourself (DIY). Not to mention its so much lighter on your pocket and also in its purest form. I searched for almond flour at all the places I could from the next door grocery store to the local baking supplier to the best super market; but could not find it. Considering the kinda person I am, if I gotta do something, I will find a way to do it. I couldn't find the ready made almond flour to make the French Macarons. I decided to make my own. Whenever I want any help in the kitchen, the first thing I do is to call my mom and ask her how to go about doing it. And there it was, the recipe to Almond Flour at home and I couldn't imagine it would be so simple. And all you need is plain raw almonds with the skin on. Do not use almonds which are roasted or fried or salted. Put almonds in a microwave safe bowl. Add water to the bowl so that almonds are completely immersed in water. Place the bowl in the microwave for 5-8 minutes. Take the bowl out of microwave, rinse the hot water and run the almonds under cold water in order to stop further heating. Drain and put them on a flat surface. Once the almonds have been drained and rinsed, you can see the skin of almonds beginning to shrivel. 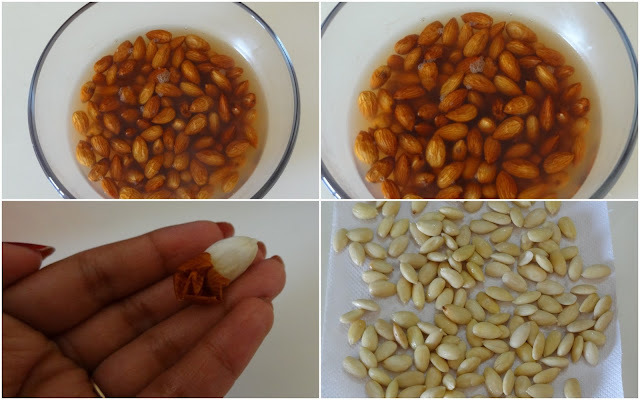 Take off the skin of the almonds by placing the almond between thumb and index finger. Gently apply the pressure between the thumb and finger and the skin will begin to pull away. This process does not take time; you can peel off the skin of one bowl of almond in less than 5 minutes. Let the almonds completely dry on a kitchen towel. Once the almonds dry completely, grind them in a grinder until it becomes a medium fine textured flour. Don't grind it too much else you will get almond butter. Sift the almond flour through a fine flour sifter. In case any big pieces are still left, you can grind again and sift it. So now, you are ready to use this almond flour. Refrigerate the flour if not using immediately. It is best to use the flour within 2 weeks of making. Your almond flour is ready for use.